Python Bikes are a Birmingham based Bike company that have been around for over 25 years. They are experts in every type of bike, as well as in accessories and modifications. From children’s first walk to ride bikes, to professional standard racing bikes. You will find a comprehensive range of to suit all your needs including BMX, mountain bikes, folding bikes and Urban bikes. There is also a new range of hybrid bikes combining the urban and mountain ranges. Now with distributors across the UK and an extensive catalogue available online, you don’t need to travel to Birmingham to get yourself a Python Bike. Python Bikes are classed as a Budget brand as the majority of their bikes come in under the £500 mark. Obviously, this keeps more cash in your wallet. However, Budget does in no way equate to cheap. Python Bikes have an excellent reputation for being well built, sturdy pieces of equipment. One of their bikes should last you years and years without any problems. Many other Budget brands may cost you less, to begin with, but will cost you significantly more in repairs during the lifetime of the bike. This isn’t a problem you will have with Python as they are truly made to last. Are Python Bikes Worth Buying? Python bikes are consistently ranked some of the best budget bikes around due to their excellent prices and quality. Although they are at the higher end of the budget range, you do get a lot for your money. This normally includes hydraulic disk brakes and a high-grade aluminium frame. The only downside that is worth mentioning is that these are not the easiest bikes to assemble. However, considering the money you save when purchasing a Python bike, it is a small price to pay. If you are experienced in bike assembly then you should be fine but if not you should have enough money left over to either pay for assembly or hopefully you can find a dealer who will assemble it free of charge for you. Once built these bikes are sturdy and reliable. Based on the hordes of great reviews these bikes have received, the excellent build quality, and value for money, the conclusion must be that these bikes are definitely worth buying. You won’t get a better bike for less money. Other budget brands just cannot compare the component quality and standard of build, whereas luxury and professional brands will cost you significantly more – at least double than the price of the equivalent Python. Premium Specification – Green – RRP around £600, but is on offer for just under £450 at the time of writing this. This is the best deal you can currently get on a Python bike right now. 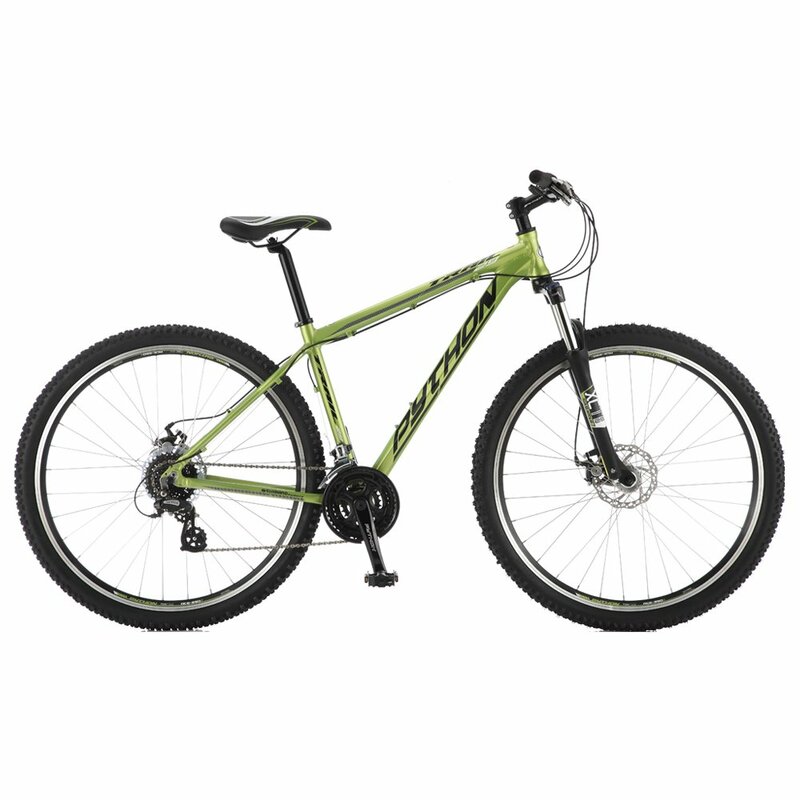 Not only do you get the amazing Trail 29” PYTHON XC/MTB mountain bike which in itself is worth about £600, but it also comes with Upgraded Tyres, Free Shipping and a saving of £150.00. This bike has Promax Mechanical Disk Breaks, Shimano Altus 24 Speed and Shimano SL-M310 Rapid Fire Levers. The 6061 Series Aluminium Frame is lightweight, strong and flexible. A SR Suntour XCT-HLO Suspension Fork is included to smooth out this bumps. It features 100ml travel with hydraulic lockout. The whole bike weighs just 15kg, so it is easy to transport if required. It even comes with a 1-year parts and labour warranty. At the time of writing this, it is rated 5 out of 5 stars by customers who praise its sturdy build and high spec components as well as its excellent value for money. Don’t worry if you miss out on this particular offer. There are always great offers to be had and the RRP prices on Pythons are great to begin with. You are never going to feel like you have wasted your money. In conclusion to the question “Are Python Bikes any good?”, the answer has got to be a resounding yes. They are very well built, sturdy and high-quality bikes that come with all the spec that you could ever require. They come in all shapes and sizes and are available for every need from cradle to retirement. You could get a Python Bike as your first bike and still be riding Python when you retire, the quality is there. Whether you are a casual rider or a seasoned pro you can count on Python bikes to take care of you and your riding needs and to do it at an excellent price with great service.